This is the third post of a serie, dedicated to chessplay and more specifically to the battle of influence on the chessboard. We are now trying to compute influence zone over the chessboard. In cas you missed previous posts, you may read part 1 and part 2. 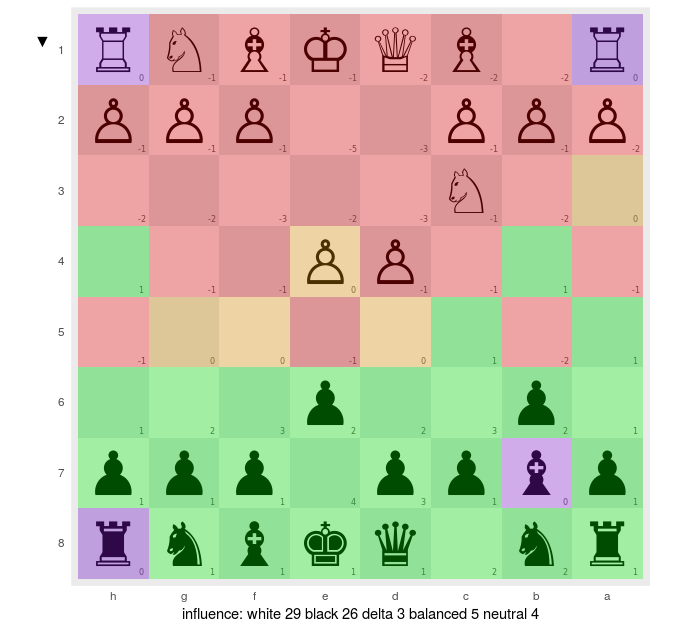 We have seen that using rchess , we can get easily the full list of moves played during a chess game, and at anytime, we can retrieve the FEN string and compute position image for each move. proceed to a video montage to understand if knowing/tracking the chessboard influence could help us improve our play. Trying to determine if a chess squarre is under white side control or black side control, requires many different computations, according to the side, the piece and the current position being studied. Moreover, a binary classification result is wrong here, as a squarre could be under control, out of control, under balanced control or, not even disputed. As each piece has its owns incidence, we’ll stick to an object oriented approach to solve the computation. We will create a base class named AbstractPiece and derived it for each kind of piece, Pawn, Knight, Bishop, Rook, Queen, and King. R6 code shown here might be sub-optimal. I had to find my way through several constraints emaning from R object oriented design. declaring a pure abstract class. I relied on a constructed approach, as I haven’t found how to do that, purely relying on R6 package. Implementing the piece influence computation for each kind of piece, provides us the ability to get its controlled squarres. 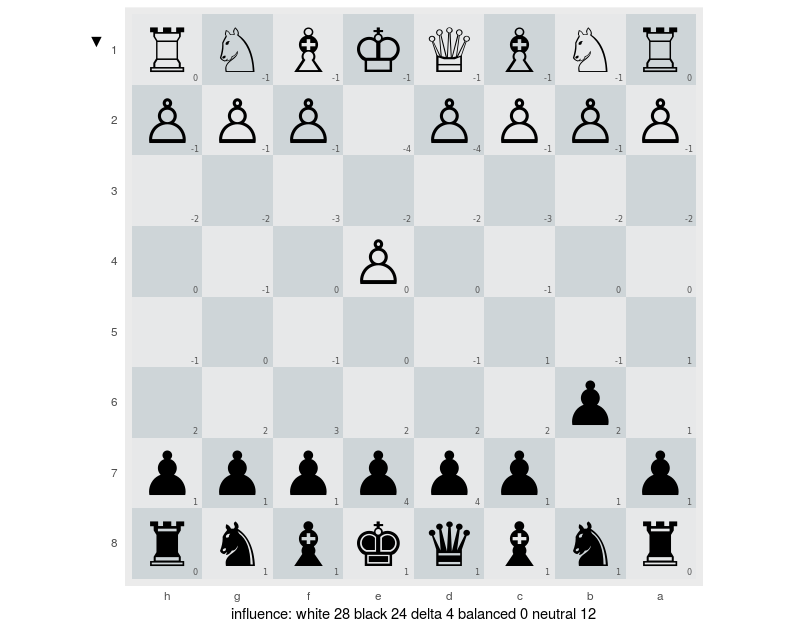 Summing all those results per side, brings us to a white side power and to a black side power, and simply differentiating it, allows us to compute the whole chessboard influence. Et voilà. We generated following result from the analysis of the move of our sample game. It appears, that this is difficult to read. We need some color to ease eye catching and accelerate understanding. Green for squarres controlled by side exposed on the south, red for opposite side, purple for uncontrolled squarres, and orange for disputed and at equilibrium squarres. Here is the result. Much sexyer! So we are now able to get a picture expressing visually influence zone on chessboard at each move. That could be used to identify threats we have unseen or ignored, and could allow us to strengthen our play, by removing some counter play moves. Next and last part, would be dedicated full-game diagram generation and to video montage to understand if knowing/tracking the chessboard influence could help us improve our play.